A robber was arrested following the activation of IBP Smokenotes after he had raided the Bradford & Bingley Harrow branch. On Wednesday, 9th January, a white male entered the Harrow branch of Bradford & Bingley Plc. and on approaching the counter produced a handgun. Cash was taken from the till positions and the raider then demanded that a third female cashier open her till and hand over the money. In accordance with company policy to keep staff safe this was duly done, but as the robber left the branch he was totally unaware that two dye-packs were contained in the stolen cash. 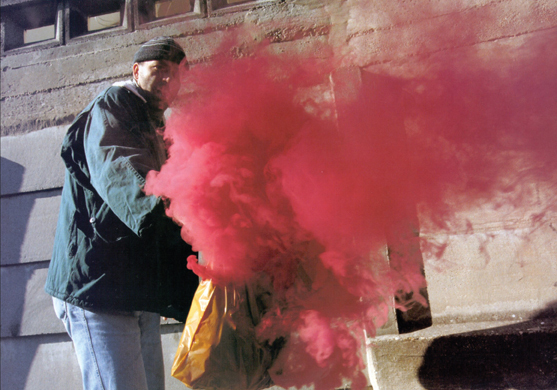 Dye-packs are designed to activate when the suspect is a considerable distance from the raided premises and that is exactly what happened. As the Bradford & Bingley raider made his escape, the Smokenotes released clouds of bright red smoke and he was arrested by local police. The stolen cash, two dye-packs and weapon were all recovered. Following police interviews the man admitted the Harrow robbery and raiding four additional Bradford & Bingley branches within Southeast England. He also admitted committing a number of robberies at other High Street banks and building societies.